Oh, and here's the before, if you're interested. P.S. For an update on Annie, please visit here. Beautiful photo and very subtle but effective editing. Nicely done! Did you use a texture? I have no experience using textures (and have no clue yet how to!) but I'd love to learn. I don't think I've ever had crabapples but they surely make stunning blossoms. And if you ever have the chance to visit Eire, do so. It is a breathtaking country! Lovely photo! And they smell as beautiful as they look! Although I do love the before picture, it's just amazing what a little texture can do! Beautiful as always! Very nice photos. Love the colors. very pretty, I like the texture! Beautiful photographs...I do like the textures... very interesting effect...BTW I do hope Annie is doing well. Hugs from Maine, Julie. I spent some time this past week photographing the blossoms on my sister's flower crab apple tree. It is loaded with pink blossoms. 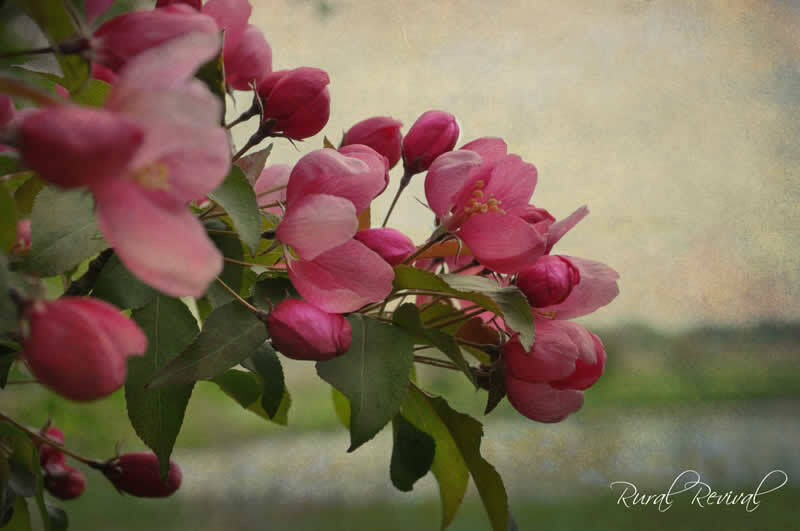 You've captured the beauty of these blossoms so well! Pink is not my first choice in plants, but that one is beautiful! Nice blog, follow your dream, it seems you have a great start in place. Love the before and after!! Such beautiful flowers! Beautiful photos. Love the textured one. So so pretty! I keep saying I'm going to learn to do textures and I keep procrastinating! I really need to. I love this.